From her front-row seat as one of the pioneers of ancient-DNA research, Shapiro explains the fieldwork, lab science, and prospective ecology involved with the so-far hypothetical endeavor. As paleogenomic science has progressed to the point that cloning a mammoth has become possible (sort of), such propositions have also attracted controversy. Shapiro calls herself “an enthusiastic realist,” writing that while recklessly resurrecting bygone species for Jurassic Park jollies would be “scientifically and ethically unjustified,” de-extinction has the potential to become “an important tool for conserving species and [restoring] habitats.” Breeding elephants that express some mammoth traits for cold hardiness, for example, might allow the pachyderms to be relocated to Arctic ecosystems to restore lost productivity there and aid in elephant conservation efforts. We’ve come a long way, baby. In the space of a few million years, primates have gone from squabbling in the canopy to walking on the Moon. But what is it about our ancestors and us that has made possible the meteoric rise of Homo sapiens to unprecedented cognitive heights? This is the question physicist Leonard Mlodinow asks and answers in his latest book, The Upright Thinkers. As the human mind flowered, so too did culture and civilization. Modern humans continue to harvest the fruits of thinking and questioning by some of the greatest minds in human history. 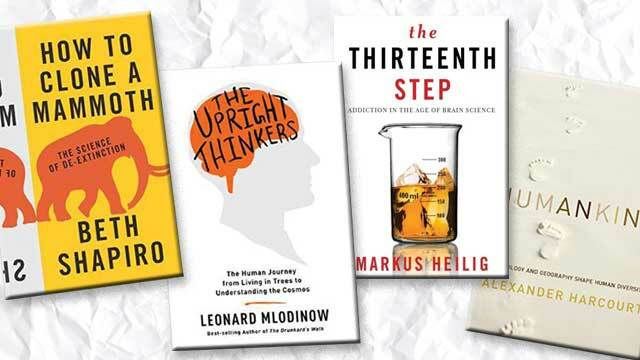 As Mlodinow details, the unquenchable curiosity morphed into science, a way of seeing the world that has in turn shaped our cultures, our bodies, and our concepts of the universe’s functioning. In the past 25 years, modern science has made quantum leaps in understanding the neurological roots of addiction. But because of humanity’s long relationship with the disease, many nonscientific approaches have become entrenched in our treatment of addiction. These older methods and newer non–evidence-based therapies, argues NIH addiction researcher Markus Heilig in The Thirteenth Step, need to yield to approaches informed by the avalanche of data continually being uncovered by today’s scientists. “The time has come to bring together the everyday realities of addictive disorders and the emerging science and available evidence,” Heilig writes. Through a series of case studies of real patients, the author elucidates the brain structure and function that underlie relapse, drug-seeking behavior, and other addiction-related phenomena. But as complete as the science seems, there are still obstacles to implementing therapies based on its findings. “Prejudice, stigma, and financial interests conspire to prevent science-based treatments from reaching patients who need them,” Heilig writes. Humanity spreads, quiltlike, across the globe, different sizes, shapes, colors, and textures evolving into a diverse patchwork of peoples and customs. UC Davis anthropologist Alexander Harcourt celebrates this diversity and dissects its origins in Humankind. Evolution, whether biological or cultural, doesn’t occur in a vacuum. There is intimate feedback between the physical environment, climate, and cohabiting plants, animals, and microbes that shapes and prunes the tree of life down to the twig of each species. And humans are no exception. As species of Homo spread out of Africa to encounter new and different ecosystems, they embarked on a slow and steady journey that would mold different phenotypes, genotypes, and cultures from the same starting material. Harcourt retraces this process, bringing the latest science to bear in painting his dynamic portrait of human biogeography.